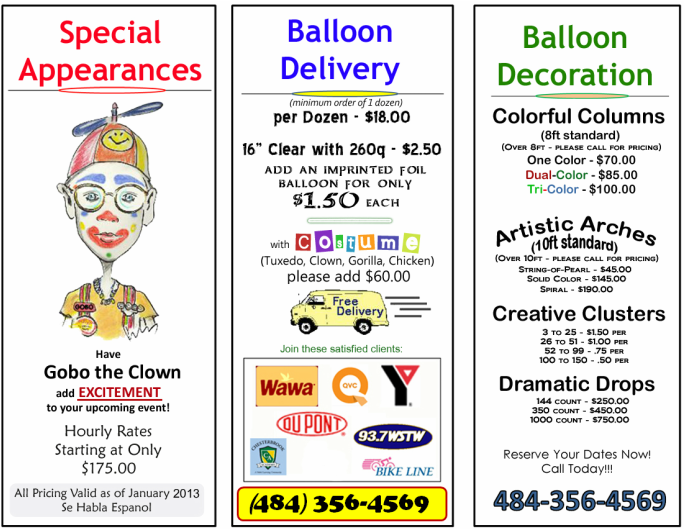 Services provided include walk-around/stage magic, juggling, and balloon décor, just to name a few. The ability to twist balloons for any age and relate with any audience. The professionalism displayed during performances agrees with The Clown Code of Ethics. There is no use of profanity or lewd remarks. Gestures and appearance is simple and clean so as not to offend anyone. After all, the ultimate goal when the work is done, guests enjoy their time and bonus, the image of myself or the Sponser(s) is/are upheld. Either onsite at your home or off site at your choice location, guests are entertained and grandeur is added, with Balloon Décor, or fun and jovial atmosphere to all those in attendance. Let us “Spin-A-Smile” for all your occasions.